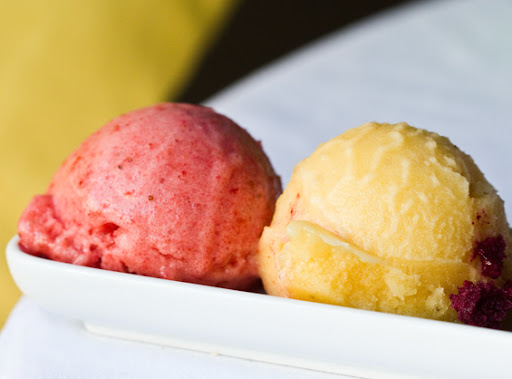 Summer Sorbets - Cool, Creamy, Easy! These Summer Sorbets are cool, creamy and surprisingly easy to make! Yesterday I blended up four flavors: Strawberry Banana, Banana Pineapple, Zippy Wild Blueberry and Spicy Mango. 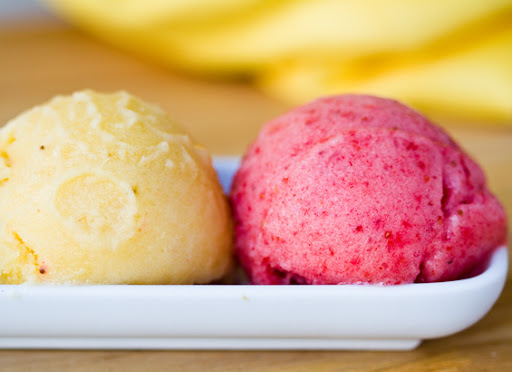 And the best part about this post is that you'll learn the basic technique I use - so you can whip up your own sorbet flavor creations! You could try creamy coconut banana, peach cinnamon, banana lime, raspberry lime, blackberry, banana papaya and more! 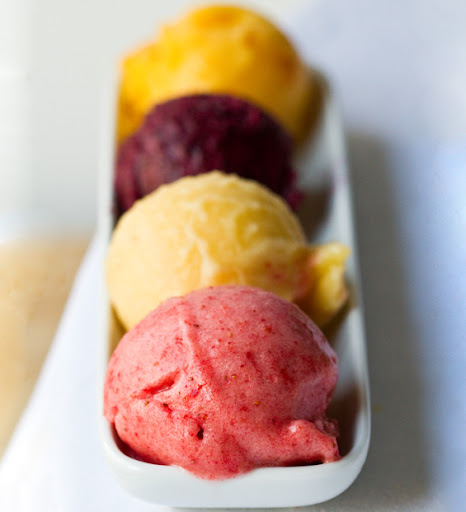 Bring on the summer heat with these colorful sorbets waiting in your freezer!.. Triple digits. It's going to be a hot one. As they say. High of 101 is what my dashboard weatherman is telling me. At least this time I have working AC. Unlike the sticky, humid NYC heatwave of 2010 where our west village apartment's AC broke and I was stuck with a ditsy little fan buzzing away - trying desperately to keep me cool. I actually resorted to dunking my face in a bowl of ice water at one point. Ah, memories. ..So this time around, I'm not complaining! I'm simply making sorbet and enjoying the warm, hot, triple digit heat. So grab a sorbet spoon and dive into these easy frosty, fruity recipes! And sorbet is really very similar to a smoothie. Just as healthy - though a tad sweeter and less complex. The main difference is that you are basically only adding frozen fruit, a bit of accent liquid and enough sweetener to get it to that sweet-tart sorbet flavor. Sorbet Tip. 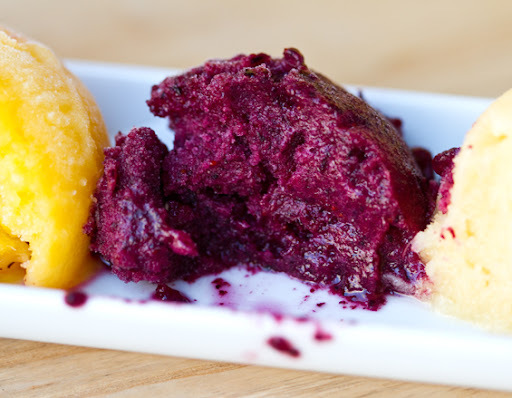 I like to use plenty of creamy fruits to make my sorbet have optimal texture - so it's not too icy and more creamy. I add in bananas, mango and even pineapple when possible. Bananas are really the best for getting that creamy sorbet texture. For this post I really started with some basic flavors. But feel free to get creative with ingredients. All sorbets listed are fat free! Tip: slightly thaw the frozen fruit so that it easily blends - but is still frosty. Blend until smooth - do not overblend. You do not want to "melt" the mixture. Keep it as thick and frosty as possible. Tip: A chilled metal container works best. If you can find small metal containers to chill for your sorbet - grab them!